IWT Cargo-Guard supplied our first floating turbidity barrier / silt curtain project in Cold Springs, NY over 25 years ago. 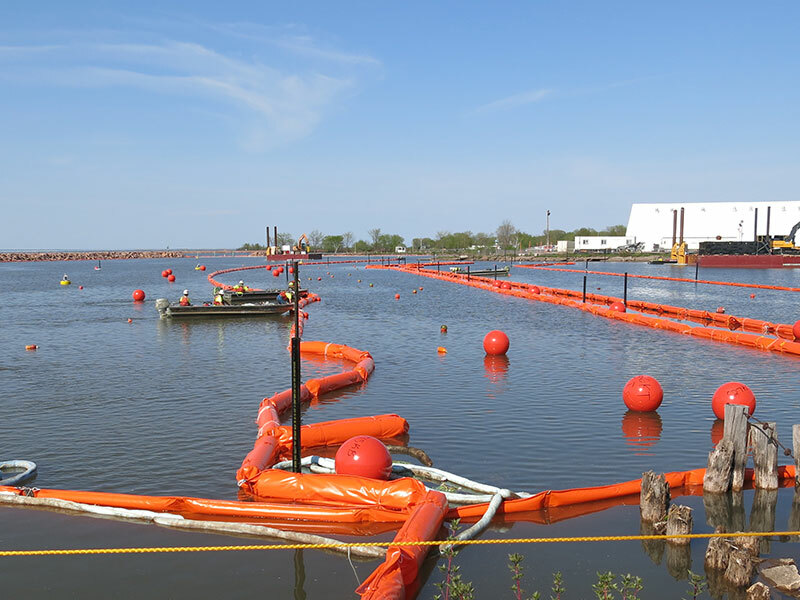 Since that time, we have worked with industry leading environmental dredging companies as well as manufacturers to design and build silt curtains and floating containment systems that withstand unique site conditions for the duration of the project. In order for a design to be successful, it is necessary to select the appropriate support elements. When selecting an anchor system consider direction of deployment, flow velocities and bottom conditions. Tidal or heavy current areas may require H piles to hold the curtains in place. The use of floating cable pile attachments allows the barrier to rise up and down with changing water elevations. Lighted navigation buoys warn the public to avoid a work zone. They also help contractors comply with local and Federal navigation requirements. We bring to the table our experience and the passion to provide our clients with a quality product and on-time delivery even during peak dredging season. We welcome the opportunity to work with you on your next project. Please contact our office at 609-971-8810. Environmental dredging operations are very different from large scale navigational dredging operations. They utilize a precise technology to remove contamination from targeted areas. A cutting head dislodges the contaminated sediment which is immediately suctioned into a flexible pipe. It is then pumped onto a covered floating barge or directly to an on-land area for dewatering. Their job is to contain any loose sediment that may be contaminated with PCS, heavy metals or other toxic materials within the work zone. In addition, setting up multiple water testing sites in the vicinity of the dredging area immediately detects any problems. 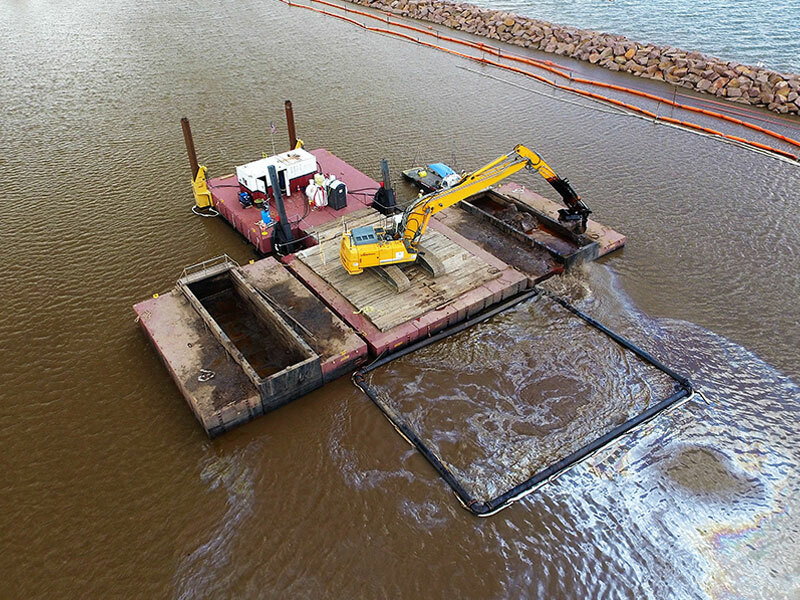 The job specific requirements of environmental dredging precludes the use of off the shelf standard floating turbidity barriers and silt curtains. There are numerous details and site-specific factors to consider. What is the material and contaminant being dredged from the waterway? Is it soluble,viscous, or heavy and will sink in the water column? Will the contaminant be reactive to the standard PVC silt curtain material? Should another containment material be used to make the turbidity or containment curtains? Should a multi-layer turbidity curtain containment system be used? Hydraulic or mechanical dredges can be used in areas where flotation is possible. However, some jobs require temporary water diversion to access shallow areas from the embankment with land-based equipment. Deploying staked turbidity barriers around the work zone is a solution when using a floating barrier is not practical. Floating barriers tend to lay over in the mud, not coming back up when the tide comes in. In-situ sediment capping eliminates excavation and disposal of contaminated material off-site. However, contaminants remaining in place at the site require long-term monitoring and cap maintenance. This ensures there is no migration or displacement of the capping materials. Construction projects in or next to waterways such as the building and maintenance of bridges, roadways, marinas and ports have a major impact on marine life and plants. Turbidity barriers and silt curtains function to contain the disturbed sediments in the work zone. This eliminates the negative effects that suspended sediments may have on the surrounding environment and ecosystem. Contractors must consider length of deployment, water depth, flow velocity, and tides when selecting a turbidity barrier or silt curtain. When J.F. Brennan and Envirocon needed to design a custom turbidity curtain layout for the Ashland/Northern States Power Superfund project in Ashland Wisconsin, IWT Cargo-Guard and Spilldam Environmental were called upon to come up with a curtain system that would work and satisfy both the oversight engineers and regulatory authorities. The dredge material, NAPL (non-aqueous phase liquids), can be particularly difficult to work with as it coats and clogs almost everything it comes in contact with. By working closely with the engineering company and the onsite contractors, J.F. Brennan and Envirocon, a multi-tiered approach was designed to provide a fail safe containment system. The system consisted of bedload baffles, carbon curtain, and turbidity barriers / silt curtains designed specifically for this project site. In addition, IWT Cargo-Guard supplied the contractor oil containment and absorbent booms along with sweeps, and oil snares to grab the material within the work zone. The most successful curtain designs involve a compilation of information provided by the engineers, site contractors, local marine contractors as well as turbidity barrier manufacturers and their representatives. Tyler Lee , Senior Project Manager J.F. Brennan Company, Inc. In order for a turbidity barrier / silt curtain to work properly, it must be site specific in design. It is also important to select the appropriate anchor systems and accessories. Many environmental dredging projects north of the Mason-Dixon line take place in late Spring through Fall. This can add significant time frames to both site supply and production. We have carefully selected the best manufacturers to supply our clients. If one is booked, we have three others to move in and service your needs. We are confident in our multi-tiered approach to supply your project in a timely fashion with a quality product. Contact our office at 609-971-8810 so we can discuss your next project.